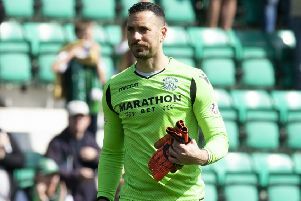 Liam Fontaine believes Hibs’ recruitment of two of the Championship’s best players in Dan Carmichael and James Keatings will give them an extra dimension as they seek to win automatic promotion to the Ladbrokes Premiership this term. Manager Alan Stubbs moved early to secure the services of former Queen of the South winger Carmichael, while striker Keatings made a surprise switch across town from city rivals Hearts. Having witnessed what both can do as an opposition player, Fontaine is confident both will make the Easter Road team a more dangerous proposition all round for their title rivals. Fontaine, who agreed to extend his stay in Leith for another two years last month, has spent the last week getting to know his new team-mates at a training camp in La Manga. Perhaps just as importantly as strengthening his attack, Stubbs has managed to retain the same back five, whose 32 goals conceded last season was only bettered by champions Hearts. Goalkeeper Mark Oxley has returned on a permanent transfer from Hull and with captain David Gray also signing a new deal, Fontaine believes the strong understanding built over the last year could prove significant. “Having the same defence as last season could be massive for us” he said. “Knowing each other’s games, especially at the back, is huge. If you look at any successful team, they’ve always had a settled backline. You build on that basis. Hopefully we can do that this season. The former Bristol City man is not naïve enough to think that Hibs will have it all their own way. With Rangers rebuilding under Mark Warburton and former Hibs favourite Ian Murray attempting to return St Mirren to the top flight, Fontaine is expecting a competitive title race in which Hibs will need to be more ruthless if they want to come out on top. “It’s not just us and Rangers in this league, St Mirren are going to be a good team coming down. Queen of the South and Falkirk were good last year. It will be another competitive season which is good for the league. • A HIBS XI face Craigroyston tomorrow night at St Mark’s Park (kick-off 7.00pm). Admission is £5 for adults and £3 for concessions.